It changed game night in my house ... fart jokes, burping contests and all. "Can we play a family game tonight?" That question used to make me cringe. As the parent of a 10-year-old and an 8-year-old, I've played my fair share of Candy Land and Go Fish. See, my husband and I actually like games. We are fans of the wildly popular, wildly irreverent Cards Against Humanity, and have been known to break out our deck at gatherings with our friends. Sometimes, though, sitting through another board game for kids makes me yearn for some time alone. So, when I heard about Not Parent Approved, a card game that calls itself "Cards Against Humanity for kids," I was intrigued. Could it solve my game night woes? My kids are getting older. I can only watch them argue over which Monopoly Junior token they want so many times before I lose my mind. So, we decided to change things up. 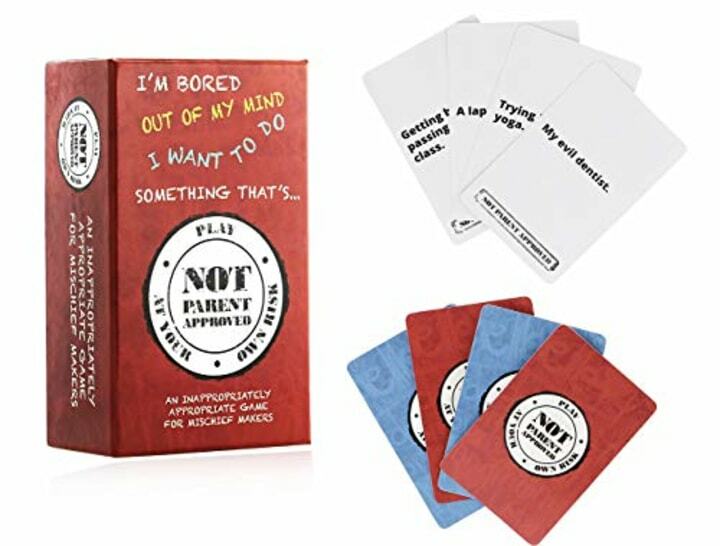 Not Parent Approved is played just like Cards Against Humanity. A player reads a card with a blank — "My parents get really mad when they see me _________." Then, the other players choose the funniest card as an answer. "Spilling something that makes it look like you peed your pants." "Feeling too old for a bouncy house, but jumping anyway." There is nothing funnier than watching your kid giggle as they read the slightly inappropriate answers aloud. After the reader chooses the funniest answer, players continue taking turns judging which is funniest. The player with the most cards at the end of the game wins. Not only is Not Parent Approved fun to play, but it's simple. It's a hit in our house, where we just can't handle becoming a banker or settling Catan after a long day. The company that makes the game describes it as "an inappropriately appropriate game for mischief makers" and "the game that makes it OK to put booger juice, vampire bunnies and grandma in the same sentence." These claims, in my experience, ring true. Now, excuse me while I go pack Hi Ho! Cherry-O and Jenga high up on a closet shelf.